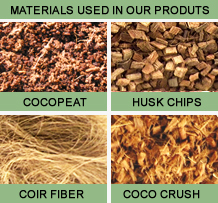 COCO BLOCKS are made of compressed Coco peat & Coir fiber material. These Blocks are made out of different mixtures to suite the buyers growing requirements.We can also add Coco chips & Coco crushed to these Block’s mixtures if required. Individually wrapped Coco Blocks can be supplied in printed or unprinted LDPE bags.